Line form the film: "To look at our Earth from the outside is to discover an entirely new planet"
Some documentaries produced in the IMAX format focus on a specific topic (Roving Mars, Titanica), while others broaden their scope, recreating the passage of time (Chronos) or showing us life as it exists under the sea (Aliens of the Deep). Blue Planet, a 1990 documentary funded by both the Smithsonian Institution's National Air and Space Museum and the Lockheed Corporation, sets out to cover the whole shebang, presenting breathtaking views of the Earth from space, then zooming in to reveal the various plants, animals, and locales that make up this wonderful planet of ours, exhibiting it all in a straightforward manner that makes it easily accessible for the entire family. 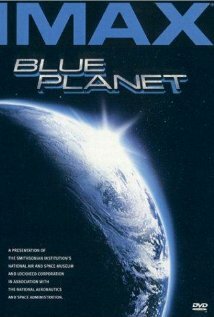 With outer space as a starting point (portions of the film were shot by astronauts during the NASA Shuttle missions), Blue Planet takes us on a whirlwind journey, traversing every continent to paint as complete a picture of earth as it possibly can. From the plains of the Serengeti to the shores of North Carolina, the movie exposes the wonder, the beauty, and the occasional horrors of life on this best of all worlds while also revealing how mankind has left its mark on the planet (and not always for the better). As with most IMAX presentations, the images in Blue Planet are stunning, especially those snapped from miles above the earth. Offering a unique view of a number of different locations (Hawaii, India, the Mediterranean), the movie then goes in for a closer look, providing a ground-level glimpse of the Sahara Desert; Antarctic ice caps breaking off into the sea; and even the ocean floor, areas where the sun’s rays never reach. In addition, the film focuses on natural disasters (including hurricanes, earthquakes, and places that, millions of years earlier, were struck by meteors) as well as man-made ones (produced in the 1990s, the depletion of the Ozone Layer was still a hot-button topic at this time, as was deforestation and man’s encroachment into the Amazon Rainforest). In short, Blue Planet leaves very few stones unturned. With its clear-cut narration style (provided by writer / editor Toni Myers) and basic approach to the subjects it presents, Blue Planet was obviously geared towards children, to give them an overview of the earth and its many occupants. But, thankfully, there’s enough here for the adults as well (the shots of a thunderstorm as seen from space are mesmerizing). So, while you might be inclined to pop Blue Planet into the DVD player to keep the kids occupied, be prepared to spend a little time with it yourself.